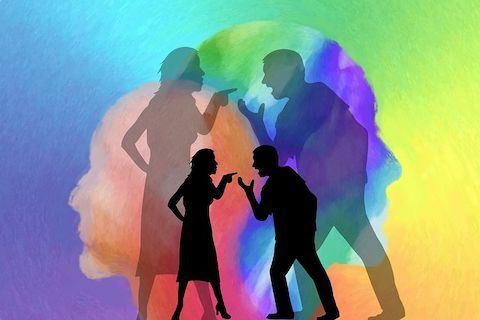 It is important to remember that we have only two healthy ways of dealing with conflict – two loving responses when another is behaving in a way that is upsetting or hurtful to us. We can move into an intent to learn about ourselves and with the other person to try to understand the other’s behavior, and discover if there is anything we are doing that is contributing to the issue. If the other person is not open to learning with us or they are not someone we are interested in learning with, then the only other loving action is to lovingly disengage from the situation, and then do our own Inner Bonding process to discover what the loving action is for ourselves. This is what you DO have control over. What you DON’T have control over is getting the other person to change. Moving into an intent to learn with the other person may bring about new learning that changes the situation between you, but this is not a given. You may still need to do your own Inner Bonding process to discover your own loving action. By opening to learning with your guidance about what you need to do for yourself in the face of the other’s choices, you become empowered to control what you can control – your own loving actions on your own behalf. This is what moves you out of feeling like a victim and into emotional freedom. It is only when you 100% accept your total lack of control over others and outcomes that you can fully access the wisdom of your guidance. As long as there is any intent to control, your frequency will remain too low to discover the loving action for yourself. People often tell me how hard it is for them to connect with their guidance. Actually, connecting with your guidance is not hard at all when your frequency is high enough, which naturally occurs when you are truly in an intent to learn about what is loving to you. But it is impossible to get your frequency high enough when you are blaming someone else, seeing yourself as a victim, trying to find a way to get the other person to change, abandoning yourself by ignoring your feelings, judging yourself, turning to addictions, eating junk food, and making someone else responsible for you. What you CAN control is your own intent, your own frequency, your own responses, your own thoughts, and your own actions toward yourself and others. Why waste energy trying to control what you can’t control? Why not just focus on what you can control – you!